SHOCKING NEW ONLINE SERIES To Probe Trump Administration, Rabbis, And Top-Secret Plan To Build Third Temple: PART ONE—DID YOU KNOW? Though I’m not a prophet, I make several incredible predictions in the upcoming work THE RABBIS, DONALD TRUMP, AND THE TOP-SECRET PLAN TO BUILD THE THIRD TEMPLE (on which a whole month of programs will air on SkyWatch TV this month), and I might as well get the biggest ones out of the way in the very beginning, so I can then proceed to explain over the course of this series why I am convinced of something very extraordinary. Without giving up THE BIGGEST SECRETS in the new book, I can say it has not been since I and my late investigative partner Cris Putnam accurately predicted the resignation of Pope Benedict XVI one year in advance (naming the very month and year he would retire while writing the best-selling book Petrus Romanus) that I’ve had such a powerful “gut feeling” about something ahead. This time, however, events set to transpire (soon, as the evidence in TEMPLE will show) are much bigger than the Prophecy of the Popes. They are, in fact, earth-shattering, and will accomplish nothing less than altering the course of history. What is about to unfold could set in motion arrival of Antichrist and Armageddon, followed by the Second Coming of Jesus Christ. During this study and in the new book, you will learn why I say this and of a secret plan to instigate it by building the Third Temple in Jerusalem. It’s happening right now behind the scenes in clandestine negotiations between global powers and religious leaders. These astonishing facts, regardless how incredible they may seem, will be unveiled during the programs and more exhaustively so in the new TEMPLE investigative work. Connected to all this, I will ultimately make the forceful argument that, when the time is right, US President Donald Trump will, as the rabbis in Israel hold, play a key role by speaking in favor of the Third Temple’s construction. When that happens, it will ignite the single most important and prophetic event in our lifetime. Unfortunately for those who at first find great joy in the Temple’s reconstruction, exuberance will be short-lived and will ultimately cave to terror. At the close of 2018, the Sanhedrin also invited seventy nations to dedicate the altar for the Third Temple:[iii] The number seventy (70) is connected to the Watchers and the arrival of Antichrist in the final days. Freemasons in the US and Israel have been secretly planning for decades to build the Third Temple? Jews are increasingly demanding access to the Temple Mount with visions of building the Third Temple? In September 2018, a newborn red heifer was certified by a board of rabbis as fulfilling all the biblical requirements for Temple service, a prerequisite for “the biblically mandated process of ritual purification for impurity that results from proximity or contact with a dead body. Because the elements needed for this ceremony have been lacking since the destruction of the Second Temple, all Jews today are considered ritually impure, thereby preventing the return of the Temple service”? [v] That is, until now. Saudi Arabia, Jewish religious leaders, and Donald Trump are negotiating behind the scenes to transfer control of Israel’s holy sites—including the Temple Mount—to the Saudis, to complete a “peace covenant” that could result in, among other things, the building of the Third Temple (more revealed on this later). 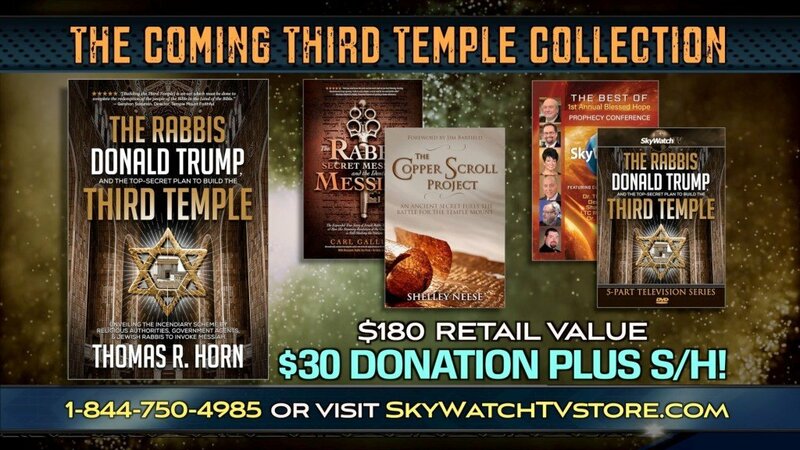 These are just some of the revelations we will examine in this series, on TV and in the pages of the groundbreaking work—THE RABBIS, DONALD TRUMP, AND THE TOP-SECRET PLAN TO BUILD THE THIRD TEMPLE. We’ll pick it up there in the next entry. [i] Arutz Sheva staff, “Plans for Third Temple Have Begun,” Israel National News, July 26, 2015, https://www.israelnationalnews.com/News/News.aspx/198621. [ii] Adam Eliyahu Berkowitz, “Sanhedrin Urges Candidates for Jerusalem Mayor to Prepare for Third Temple,” Breaking Israel News, November 8, 2018, https://www.breakingisraelnews.com/116619/sanhedrin-jerusalem-mayor-temple/. [iii] “Sanhedrin Invites 70 Nations to Dedicate Altar for Third Temple,” Charisma News, December 7, 2018, https://www.charismanews.com/opinion/standing-with-israel/74307-sanhedrin-invites-70-nations-to-dedicate-altar-for-third-temple. [iv] Marissa Newman, “Rare Interfaith Temple Mount Confab Highlights a Christian Awakening,” Times of Israel, December 5, 2018, https://www.timesofisrael.com/rare-interfaith-temple-mount-confab-highlights-a-christian-awakening/. [v] Adam Eliyahu Berkowitz, “Harbinger to Messiah: Red Heifer is Born,” Breaking Israel News, September 5, 2018, https://www.breakingisraelnews.com/113476/temple-institute-certifies-red-heifer/. [vii] Zia H Shah, “How Can We Build the Third Temple Together?” Muslim Times, December 6, 2017, https://themuslimtimes.info/2017/04/20/how-can-we-build-the-third-temple-together/.